Current scheduling policy lacks the awareness of a significant and measurable increased risk of injury to the players at (School) and similar sized schools. What is alarming, and requires immediate awareness, are the findings of the most recent and advanced studies related to head injuries. These studies strongly suggest that (School System) scheduling policy as currently constituted, subjects student-athletes of the smaller schools, not only to a greater risk of injury but to a greater risk of serious head trauma including concussions and Chronic Traumatic Encephalopathy (CTE). Due to limited enrollment (School) and schools with similar enrollment have a higher need to ask, and train, a small volume of players to do the large amount of labor needed to field a football program. Enrollment at the smaller schools is not typically sufficient to provide enough players to field a Junior Varsity team on a weekly basis. Compared to larger schools, football programs classified at the lower levels have a higher percentage of football players playing two (2) positions at minimum and often have added responsibilities of being part of one (or more) of our six special teams units. A high percentage of our players must often play up to eight (8) different positions during a typical Friday night game. A game played to regulation consists of approximately 140 plays (60 Offensive, 60 Defensive, and 20 Special Teams plays). In contrast, when (School) was a larger school, our team rarely had to utilize an individual player in more than 70 or 80 plays during times of competition because of available depth. Research and developments in the field of head trauma for athletes suggest that causes can come from repeated hits taken to the head with one specific hit culminating into a recognized and diagnosed concussion. Research also identifies the optimum number of collisions to the head a football player should take throughout a season as under 700. After 700 head collisions, the most recent neurological studies conclude that student athletes reach a level of high risk to incur brain trauma that impacts the student-athletes learning ability in the classroom. The (School System) cross-district scheduling policy, while unintentional, has forced a situation on the field that runs diametrically opposed to the best science related to the safety of our student-athletes. What concerns me is the risk of repeated hits, or any of the prescribed 700 collisions to (Our Schools) players happening against competition with a student enrollment that places them at a higher classification then our own. With higher enrollment to populate football teams it will be infrequent that the players on opposing teams will require the same demand as players on the (Our Schools) team. Under current (School System) policy it is required for (Small School) District teams to consistently face this situation over the next two (2) seasons. If the 2013-2014 seasons are played as scheduled, there will be 12 instances over the next two years that on any given Friday night in (School System) we will have created a circumstance in which one team will be in direct competition with a team that has been placed two (2) classifications above it. There will be 44 instances over the next two years in which teams are in competition with an opponent one classification above it. Measures that have been put in place at the (School System) level include annual NFHS Concussion Management Courses, the re-structuring of fall sports pre-season activity limits and an 8 Hour On-Line (State Association) Coaches Class to increase knowledge amongst coaches on issues of student athlete safety. (School System) Athletics intra-classification scheduling policy stands in direct conflict of proper safety precautions for (School System) student athletes and puts football players within our (School System) at an over-exposed risk of injury. As the first kickoff of the High School football season is more than 200 days away, there is no reason not to revisit our scheduling policies and execute a plan of action to adjust the upcoming scheduling cycle with the goal of maximizing player safety within the (Small School) District. Fortunately, our culture as a progressive school system affords us the opportunity to recognize unintended consequences of our scheduling predicament and there is ample time to effectuate appropriate changes to the schedules for the upcoming seasons. Special attention should be specifically given to the (Smallest) schools in (our School system). Through experience, an appropriate policy would require schools to schedule a minimum of 60% of their season schedules (6 games) within their classification. In no event, should a school be scheduled to compete against an opponent which is more than one classification, or in my opinion, a school with enrollment of 250 students above it. Our highest scheduling priority must be to ensure that (School System) players are performing in the safest environments that our county can provide. By giving thoughtful consideration now we may save several cases of serious head trauma which, based on the latest science can be expected, with the current (School System) football scheduling philosophy. In a county wide plan of action the single most preventable way to deal with these concerns is the scheduling of the events themselves in a manner to protect our student athletes from the long lasting symptoms of head trauma while they participate (and pay an athletic fee to be part of) (School System) interscholastic football teams. I look forward to your response and would be more than willing to participate in a plan of action. Commentary: It is important to note the CTE link is still ongoing, however the concerns about repetitive trauma is very real. One sticking point for the Athletic Administration in my School System is the fact that some of the Bigger Schools may have smaller numbers on their teams due to lack of participation from the student body. I don’t necessarily disagree that if you are classified as a 5A program and only have 40 Players on your football team than there is justification for being on a 4A or 3A team’s football schedule. If a school has a lot of available population but has small participation and justifies that as the reason for being on a smaller schools football schedule I feel that there needs to be a control measure in place to insure that justification is proper. At the time of this writing there have been NO changes that have occurred or adoption of any measures on behalf of the student athletes. Thanks for the interest in our work and, more, the work you’re doing to help your players. I’m the 3rd member of the ———– ———————————————–. I’ve been an athletic trainer at the high school, small college, and now D1 level for many years. My expertise on — is to provide the clinical application perspective to our work. That being said, I’m very impressed with your insight into how the research being done by us and others translates to application with your team. You are absolutely correct that it’s all about the number of blows to the head. As you point out on the first page of your letter, the smaller the team, the more positions, i.e., the more time the players have to play in the game. You make a very important point there. On the second page you talk about playing against teams in a higher classification. Other than number of hits, another component of small schools playing larger school is that as the competition gets better, players seem to revert to “instinct” or bad technique as a way to compensate. They either lose their focus or just use the most effective weapon they have, the helmet, to try to counter their lack of size, fatigue, or skill to overcome the competition. This practice only increases the number of hits to the head. (Author): I totally agree with your letter and think you did a great job in preparing it. Schools should not be playing against other schools that are much larger and have many more football players. Players on smaller schools may face 3 or 4 fresh players during the course of a game while they do not have time to recover. There is not any good data available in this area, but it is common sense – especially when you are talking about 5 or 6 times a season when you have to play larger schools. If you are not able to change things it would be a good idea ( if you do not do it already) to collect injury to see what happens when you play larger schools versus smaller schools. Thank you for your email (and apologies for my delayed reply). I read your letter and would like to acknowledge that it reads to me as a well thought out response to the issue you are describing. There is a reason why Division III schools don’t play Division I schools in football, not unlike the reasons you describe in your letter regarding 3A vs. 5A schools. I hope your school system affords your letter, its message, and the solutions you proposed with the strongest consideration. I think this is an outstanding letter. I completely agree with your assessment that students at 3A schools are at disadvantage compared to 5A schools. I would be very curious what kind of response you get from the conference. In my mind, it’s very important for all schools, but especially smaller schools to limit the number of hits during practices or possibly even play fewer games in the season. I greatly appreciate your interest and advocacy. We are —————————————– ——————————– ———————— that I’d like to invite you to to discuss further. ———— will follow up with the specifics. Regarding the specific issue of your letter, you’ve elucidated your argument well and the letter is fine. I’m concerned about the size/strength differences btw 3A and 5A – I agree that will pose risks for the athletes, and you are right that it then is even worse with they have double the exposure. Keep me posted on where this goes. This is a great step! I’m running this by my colleagues to see if we have any further recommendations for you. Thank you to all participants of the Friday January 11th and Tuesday January 15th meetings which centered on safety issues related to (School System) football schedules. 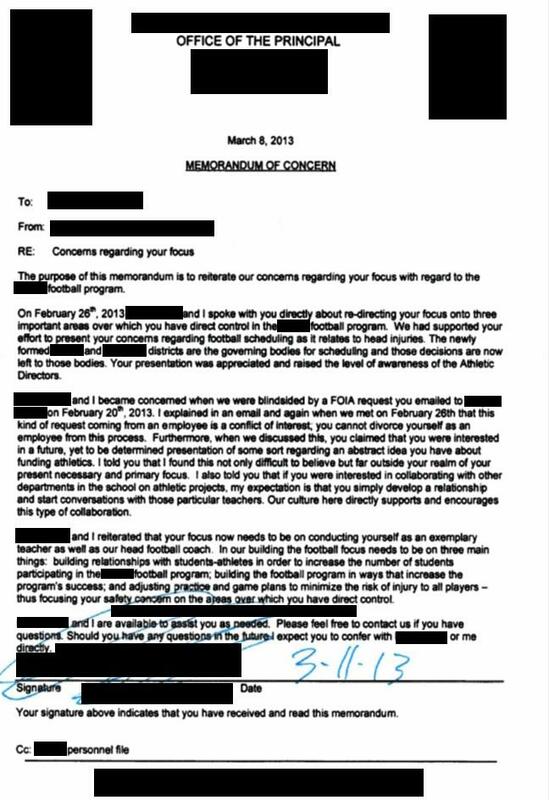 The urgency in which everyone responded to the issues raised in the letter presented to (Athletic Director) on January 8th is appreciated. These meetings lasted a combined 4 hours in length and will hopefully culminate as the first steps taken toward developing a scheduling philosophy that ensures (School System) football schedules are viewed, first and foremost, through the lens of safety. I hope a shared enthusiasm will grow from our discussions moving forward. Current (School) football schedule with suggested adjustments for the upcoming 20 Game cycle to fit “Safety Scheduling” criteria as discussed below. After thoughtful conversation and the productive tone established in our meetings, we collectively lack a plan of action that can be measured and implemented to prevent our players from overexposed risk of injury for the upcoming season. The only action that was formulated from the meetings was for me to individually re-arrange each (School System) football programs regular season schedule, (with exception of ———-), and present it to each school at the (School System) athletic administration meeting on February 13th. This assignment has been tasked presumably for consideration and determination on whether the leadership shown by (Our Schools) position in this matter is deemed appropriate. While I am happy to draft the proposed framework confirming the practical applicability to schedule football in a safe manner, I do not believe it should be a necessity for me to “convince” the athletic directors to adopt appropriate measures on behalf of their student athletes. The +250/-250 model was debated by participants of our meetings with no conclusion being reached. Self-conducted research using a set hypothetical distance of travel was produced to support the +250 /-250 model and included in the packet given to each member of the January 15th meeting. I encourage each of us to advocate, develop, and install policy that will better protect our student athletes with necessary adjustments to the current football scheduling cycle. While unintentional, recent studies make it obvious that current policy subjects student-athletes of the smaller schools not only to a greater risk of injury, but to an added risk of head trauma including concussions and Chronic Traumatic Encephalopathy. policy from sport to sport within our building and school to school within our county. Our advocacy could potentially model a proactive safety approach to the entire nation. We are at the beginning of what will be looked back upon as a necessary launch of preventive measures being taken into consideration in regards to student athletes preparing for the competitive arena. (Our School) will be the flag bearers on this issue. I am committed to, and will prioritize, the safety of our student athletes. Please lend support to the measures that will be suggested and presented, in addition to a newly drafted countywide schedule, between now and February 13. Attached is a drafted “Plan of Action” to be reviewed by all and implemented immediately in addition to the presentation on February 12th. I spoke with State Senator ————— at length last night regarding his bill and policies that we are trying to pioneer and model within our state. He seemed very encouraged as he and I will be communicating further about these issues in the days and weeks to come. Any feedback would be appreciated as all actions described in the attached document can be acted upon immediately at the county and individual school level within (our school system). 1. (Athletic Administration) would gather and forward district schools’ schedules to you so you could work with them and create drafted possible schedules that fit within your proposed parameters. 2. You would work on drafts of schedules that fit within your proposed parameters – to present to the athletic directors at the February 12th meeting. 3. You would work on creating a powerpoint presentation to communicate your position to the district athletic directors for you to present at the February 12th, 2013 meeting of athletic directors. Beyond the three action items noted above and agreed upon in our meeting on January 15th, you do not have administrative support either at the school level from (Principal or Athletic Director) or the district level with (Athletic Supervisor); and you do not have the authority to take any other course of action as a representative of (Our School System). In fact, my guidance and direction to you as your principal is to follow the above steps that we agreed upon in our meeting on January 15th. Any other steps made by you are premature and ill advised at this point in the process. You must utilize the processes in place at our county and district level. We agreed on next steps in our meeting on January 15th and I have outlined those again for you above. I fully expect you to follow those steps and to allow the processes within our school system and our athletic district to work. As an employee of (Our School System) you do not have support and you do not have the authority to take any steps beyond those we agreed to and that I noted above at this point in the process. As you have noted, you have our support for the next steps noted above; and you following any other course of action outside of those steps noted above at this time would lead me to question your true intentions and motives as related to this project. (Athletic Director) will be meeting with you shortly to communicate this same message to you face to face. See me with questions or concerns. The use of “public health issue” will probably be interpreted as a bit alarmist and might not be an appropriate descriptor for your work. This is an issue that pertains to a relatively very small segment of “the public” – people who choose to assume some risk and play football. It was nice meeting you too and as I stated last night it is refreshing to see a coach taking an active role in their program, outside of the Xs and Os. I will share this plan with the other regional supervisors next week. Wow, keep fighting the good fight. Great presentation. Just want to follow up on where we are now at the county level…..
As I exited I handed the stack of newly drafted schedules to (Athletics Supervisor) and thanked him for his time and reminded him that he tasked me to do them. We never even looked at them or mentioned them during the meeting. Interesting day……think the two words that sum it up are MASS HYSTERIA! If a school has a lot of available population but has small participation and justifies that as the reason for being on a smaller schools football schedule I feel that there needs to be a control measure in place to ensure that justification is proper. When I gave this answer to the same question during my presentation, again there was no effectual change that came of it. Once again I applaud this individual for taking a stance that is both correct – in my humble opinion – and daring. We need more coaches like this around the country; if there were none of us would have to be so concerned about the minutia of things like “safer tackling” and “practice limits”. Those would be taken care of by individuals like this one, who put player safety first. KUDOS for taking the obviously unpopular, but morally correct, position !!! 1- Some administrators are self-serving, keep the status quo ” politicians ” who do not wish to address facts…that may create an impetus for unpopular change…or upset various parents. 2- Two school administrators – one a special education administrator…professing that sport-related concussions have nothing to do with psychology or school-related affairs. 3- The emergence of a growing trend of school administrators who demonstrate lack a conscience. …so beware some persons may wish to ” kill the concussion / brain injury messenger “. 5- I must assume the type of situation described in this blog is NOT UNIQUE…and is occurring in some fashion in other sections of the USA. 6- I have a strong belief in God and the after-life. Thus I believe NO ONE PERSON escapes absolute justice…as all are accountable to God upon their death…and ALL MORAL behaving persons are also rewarded for following their conscience. Great Article! I am running into a lot of these same issues and all I am trying to do is get the powers that be to take a look at a product that serves as an early warning system as part of a responsible concussion management program which already has significant legislative backing.